We have made 3d models of gamefield for ABU Robocon 2017 Japan. Using these 3d Models. You can test you ideas and machines in a 3d simulation software. We have included files in format of .igs , .stp, catia, creo and solidworks. 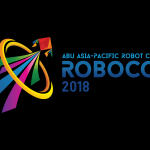 The ABU Asia-Pacific Robot Contest “Robocon 2017” will be held in Tokyo, Japan. To get the participants acquainted with the format of the contest, the theme rule book was launched by NHK Japan. The theme revolves around the word “asobi” (play), which is also a fundamental philosophy behind Robocon. In “asobi,” playful, unique, original show of skills is often more important than winning or losing, as everyone – friend and foe alike – can applaud and enjoy them. In ABU Robocon, safety is a top priority. Participants shall give safety precedence over everything at all times, from the robot designing and building stages to taking part in the actual contest. They are also asked to cooperate fully with the organizer in order to ensure a safe running of the contest for everyone involved, including team members, spectators, officials, and staff, as well as for the surrounding environment. 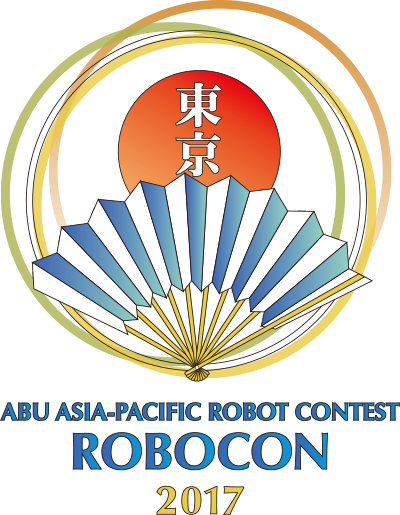 All domestic contests held in order to select the representing teams that will participate in ABU Robocon 2017 Tokyo should adhere to the rules laid out in this Rule Book. However, it is understood that if (a) material(s) is/are not available, organisers are to employ the best possible replacement(s) available in their country/region. Each game will be conducted between two teams, each with one (1) robot. Each side consists of a Start Zone, Throwing Area, and Loading Area as seen in Figures. On the field are seven (7) spots consisting of a circular table attached to a column with varying heights and areas. Of the seven (7) spots, five (5) are placed along the centre line dividing the sides, while the remaining two (2) are placed near to each side. The heights and sizes of each spot are as shown in Figures. At the start of the game, a beach ball rests on the centre of all the spots. The number of discs a team can use during the game shall be fifty (50) placed at the Loading Area. After the start of the game, the team may load discs onto its robot once the robot reaches the Loading Area. The robots of both teams may throw discs at any ball on any spot to knock the balls off the spots. Scores will be counted when a team’s disc lands on a spot where its ball has been knocked off. When all the balls have been knocked off of their spot and a team successfully lands its discs on all the spots, that team reaches “APPARE!”, and is declared the winner of the game. If neither team reaches “APPARE!”, and either both use up the fifty (50) discs or the game time of three (3) minutes passes, the game shall end. The winner will be decided by who has the higher score at the said end of the game. Prior to each game, a one-minute set-up time is given to the teams through the signal from the referee. The three (3) team members and up to three (3) pit crew members shall be allowed to participate in the set-up. Each team shall commence set-up when the signal is given, and must stop when the one (1) minute is up. If a team fails to complete its set-up within the given one (1) minute, it may resume set-up after the start of the game by obtaining permission from the referee. After the end of set-up time, the game shall begin at the signal from the referee. Teams that complete their set-up after the start of the game shall obtain permission from the referee at that moment to commence moving their robots. Team members are not allowed to enter the game field without permission from the referee. Team members are not allowed to touch their robot other than after referee permission during a retry or disc loading. If a team is controlling the robot manually, one (1) pre-registered operator may do so from the designated area outside the game field. During the game, a team may load the discs once all parts of the robot touching the game field floor completely enter the Loading Area, and permission is given by the referee. Team members may load the discs manually. Jigs and containers such as magazines may be used during loading, but if these are to remain attached to the robot, they shall be included in the 6 robot size. After loading, a team may restart after permission from the referee. Until then, no part of the robot may touch the floor outside the Loading Area. If a team is deemed to be in violation, the robot must return to LA for a mandatory retry. 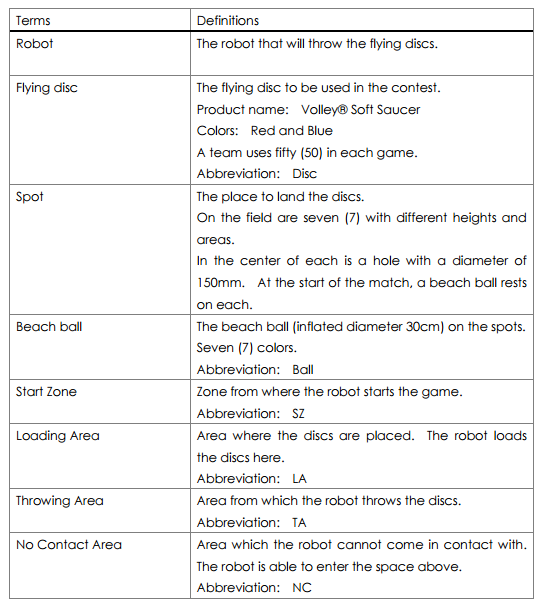 The robot may throw discs only when it is in contact with the Throwing Area and no other area. The discs for each team will be prepared by the organiser. If a disc that was loaded onto a robot falls on the floor in or outside the game field during the game, that disc becomes invalid and can no longer be used. After the start of the game, a team is given the following points when its disc lands on a spot without a ball 1) The spot nearest to the team: 1 point, regardless of number of discs 2) The five spots aligned in the center: 1 point per disc 3) The spot farthest from the team: 5 points per disc. Points shall be given regardless of whether the ball is knocked off before or after that disc lands. The score shall be finalized after the referee counts all the discs on the spots without their balls, after the end of the game. Once a team reaches “APPARE!”, the game shall end in that instant. The game shall also end if neither team reaches “APPARE!” and the game time of three (3) minutes passes. 2) The team with the higher score. 3) The team with more points from landing on the farthest spot. 4) The team with more spots from which they gained points 7. 5) The team with a higher total score gained from the center spots 6) Judges’ decision. A retry is allowed only after the referee gives permission upon request from a team member. The team granted a retry shall immediately carry its robot to the Start Zone and begin work there. A team may ask for as many retries as necessary. A team may not load discs during a retry. The team may use discs already loaded on the robot before the retry is granted. The team shall restart after permission from the referee. The team who commits the following shall be deemed to be in violation of the rules and subject to a mandatory retry. The robot or a part of the robot comes in contact with the No Contact Area. A team member touches the robot without referee permission. A team makes a false start. Any other acts deemed to be an infringement on the rules. If a team is deemed to have committed the following intentionally, the team shall be disqualified for that game. Any acts that pose danger to the game field, its surroundings, the robots, and/or people. Use of wind as obstruction, and any other activity that can be judged to have no other purpose than to obstruct the opponent. Any act of disobedience against a referee’s warning. Any other act that goes against the spirit of fair play. One (1) representing team from each country or region shall participate in ABU Robocon 2017. As the host country, Japan shall be represented by two (2) teams. A team consists of three (3) team members who are students and one instructor, who all belong to the same university/college/polytechnic. In addition to the above mentioned 6.2, three (3) members are allowed to be registered as the pit crew. The pit crew may assist in the work in the pit area, in carrying the robot from the pit area to the game field, and during set-up. Each team may bring one (1) robot only to participate in the contest. The robot must be hand-built by students from the same university/college/polytechnic. The robot may be fully automatic or controlled manually. It may be controlled wirelessly or by cable. The robot must not split into parts during the game. The robot (excluding the controller and cable) must fit into the Start Zone at the start of the game, including the space above. Throughout the game, the robot together with any containers used in disc loading shall not exceed length 1500mm x width 1500mm x height 1800mm. The total weight of the robot, any containers that will be attached to the robot after disc loading, controller, cables, and any other equipment the team brings for use in the game must not exceed 25kg. Back-up batteries (of the same type as that originally installed in the robot) are exempt. Each team shall prepare its own power source. All batteries used in the robot, controller, and any other device used during the game shall not exceed 24V. The maximum voltage within the circuit(s) shall not exceed 42V. Teams using compressed air must use either a container made for the purpose, or a plastic soda bottle in pristine condition that is prepared appropriately. Air pressure must not exceed 600kPa. Any power source deemed dangerous may be banned from use. The robot must be designed and built so as to pose danger to no one, including the team, the opposing team, the people in the surroundings, and the venue. The use of the following are prohibited: lead-acid batteries (including colloidal), power sources that involve flames and/or high temperatures, anything that may contaminate the game field, as well as anything that may cause the robots to break down and/or create a situation that hinders the procession of the contest. If laser is used, it shall be class 2 or less. Full care must be taken not to damage the eyes of anyone in the venue, from the design and practice stages. Emergency stop buttons must be built on all robots. 1) Specifications: it shall be a red button on a yellow base. It is recommended that teams adhere to ISO 13850, or JIS B 9703. (JIS = Japanese Industrial Standard) 10. 2) Placement: it shall be placed where it is easy to find and activate, so that team members or the referee can stop the robot immediately in an emergency situation. The referee and organisers will check to make sure the robot meets the safety requirements, and prohibit any team that does not meet them from participating.